This post is sponsored by Pet Supplies Plus. All opinions are my own. Before my husband and I adopted our first dog Bella almost 6 years ago, I never knew how attached I could become to an animal. I never had a dog or cat while growing up, and while goldfish are pretty awesome, it's really hard to take them for walks and snuggle with them at night. After Bella came into our lives, I instantly fell in love. She was part of my soul and if anything happened to this animal, like her running away and getting lost forever, I would be completely devastated. Then little miss Libby came into our lives last year, and now I have two precious pups who I have vowed to keep safe from danger as long as they live. Every year an estimated 10 million dogs and cats are lost or stolen and it’s an issue that will affect one in every three pets at some point in their lives. One in every three! That's terrifying! According to the American Veterinary Medical Association, dogs with a registered microchip are 2.5 times more likely to be returned to their owner when turned into a shelter; cats are a remarkable 21.4 times more likely. 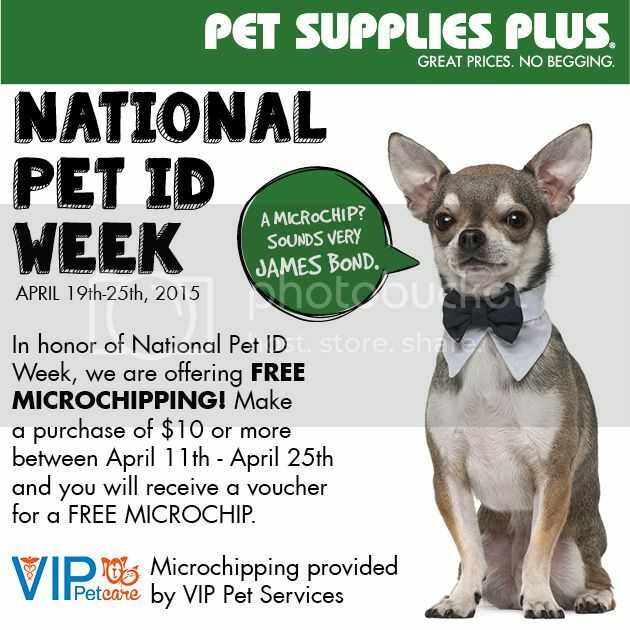 To celebrate National Pet ID Week, a nationally recognized week focusing on identifying and returning lost pets to their owners, Pet Supplies Plus are hosting free and low-cost pet ID events at participating locations from April 19 through April 25. Think this might be painful for your pet? Think again! Implanting a microchip is a relatively painless process. The device, which is about the size of a grain of rice, is inserted just below the skin. Pets having the process done at Pet Supplies Plus are registered almost immediately with FoundAnimals.org, a non-profit registry that also works with the free AHAA association chip directory. Once you type in your city/state and find the location nearest to you, just click “Visit Store Page” to find that location’s clinic schedule and National Pet ID Week offerings. I can't wait to visit my local Pet Supplies Plus this Saturday!